As a novice, I thought diving at night was too dangerous and uncanny, and doing it will require much courage in its truest sense. My turn for such experience was two years later after I got certified for the OWD course. Although it was an optional dive for the AOWD, I chose to undergo it with the recommendation of my mentor. I trusted his judgment that I can do it, confident that he will be with me for the dive. I made it without him though, he entrusted me to equally able divers who have become my friends too. It was a completely different experience, I promised myself to do it again! The darkness can be a limitation but there is nothing to be scared about it, in fact night diving is more relaxing than diving during the day. It is because, extra care and proper preparation is necessary – familiar site, comfortable gear, favorite dive buddy, shallow areas and definitely no diving in difficult conditions. Diving at night is slow and steady, thus this pace makes it very relaxing for many divers. 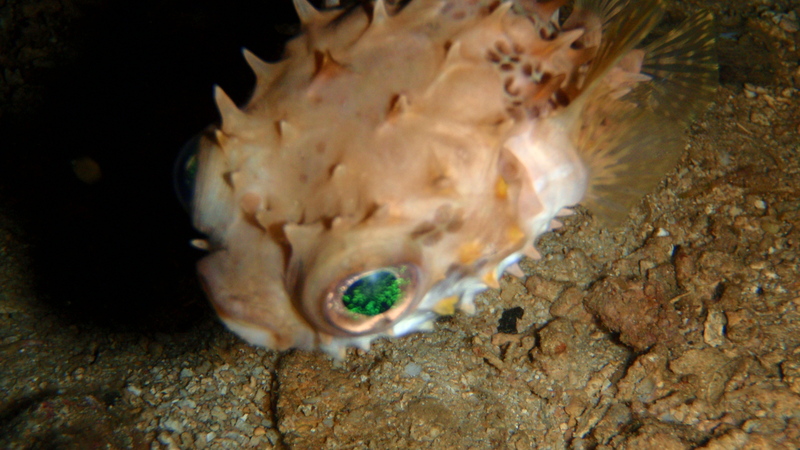 My few night dives has been pleasant, my dive buddy and I see to it that we are pretty conditioned for the extra activity during the night after our day dives. My three night dives after my lessons with my mentor, were all with my favorite dive buddy. Just a month after my AOWD lessons, planning for three dives I requested my mentor for a night dive, though informing him that my dive buddy is not certified for such. He had no qualms about it, I remembered my dive buddy was worried for me more than for himself. It was wonderful, variety of night critters showed up and I was amazed of the night organisms that glow in the dark. My dive buddy and I decided to have a night dive when we went to Padre Burgos, Southern Leyte. It was a different experience as we were in a different site totally new to us. But I did stupid mistakes before we could descend, it was a shore entry. Like losing my mask twice while struggling with my tank, my buddy have to search it for me. We were in the waters when I had difficulty controlling my buoyancy, we went back to the shore for more weights. But once down, we were treated with the variety of marine life in the area, we stayed 58 minutes in the waters – that’s almost an hour! This night dive was a filler after we missed the morning dive schedule of the resort, it was just our second dive for the day so we still have enough energy and we look forward to it. The site was totally new to us but I think we were confident enough for it, and I guess too excited to discover new sightings. My dive buddy and I were left alone as we explore on our own in the darkness, we were down for over an hour! The night critters abound in the area and the bioluminescence struck me once more…. My dive buddy said it was not a night dive technically, but we descend at 5:48pm and had our torches on until we ascend at 6:34pm. Our aim was to maximize our time while at Apo Reefs, thus do three dives despite the limited time. The refilling of tanks took much time thus the additional time requirements. Watching the pinkish horizons as we descend was so calming and the display of pelagic, plus the friendly turtle was a real treat in our last dive. 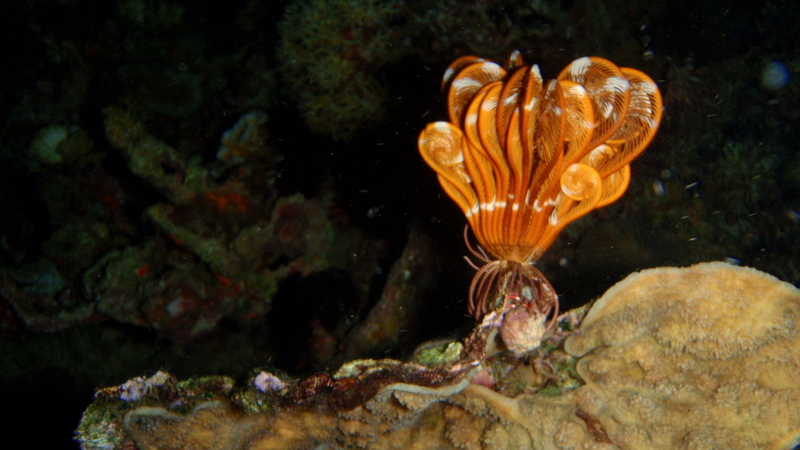 The feather star looks different at night! 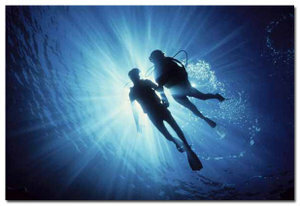 Indeed, diving at night is completely a different experience – wonderful experience I must say. When dark falls, diverse species come out – those that can not be seen during the day dominate the reef like crabs, shrimps or lobster and even octopi, barracuda and shark. The coral reef at night is a strange place. And there’s one moment I wanted to witness again – the spawning of corals as it release thousands of bundles of eggs and sperm – it look so alive. An undeniable truth that corals are animals and not rocks as mostly perceived it to be. I think I need to have one night dive before the year ends! NB. Photos courtesy of Angel using Olympus Tough 8000 with PT 045 casing. As a tradition I went for my concluding dive for 2011, and I have every reason to rejoice. After almost three years, I’ll be coming back to the wonderful Agutayan Island off Jasaan coast, a site I was enamored in the early days of my diving. Secondly, I’ll be diving with my dive mentor exclusive after more than two years, and most importantly my favorite dive buddy is coming over to join me for our last dive of the year. Few days earlier, the weather forecast threatened a storm in Northern Mindanao on the dates but I was keeping my fingers crossed hoping that the conditions would still allow us. True enough, we made it to Jasaan on a Saturday morning with bright sunny skies with no trace of overcast horizon. The previous night though was a disaster, the flash flood from Cagayan de Oro river have wreck havoc on the communities along the river bank and lowland areas, it was a total nightmare for everyone. My dive mentor was kind enough to arrange everything for the trip though hesitant at first, knowing for sure that visibility would be affected. Aboard the bigger and wider Sakayan, we sped off to the island about five kilometers away from the shore. The municipal waters which has always been blue, serene and beautiful now marred with tons of debris all floating around. Just watching heaps of floating trash, one can judge the enormous wreckage in the city only God can tell how severe it was! I had a heavy heart watching the horizons as we continue to cruise for Agutayan. We descend past 11am already, as always diving with my mentor has the same old familiar feeling – so safe and comfortable, Angel and I had DM one on one. We tried to maneuver the surface current as we reached for the bouyline for our final descend. But just few meters down the surface, immersed in the cold waters, I totally forgot the clutters above us. We went around the slopes and had encounters of marine life, at least six turtles graced us – the last was a huge one on his back to us digging something in the reef crevice, perhaps feeding himself with some algae. He was so surprised to notice us, he scampered away and disappeared a cloud of silt before us. There were few nudis, worms, shrimps and other invertebrates, triggerfishes which we avoided for fear of attack. 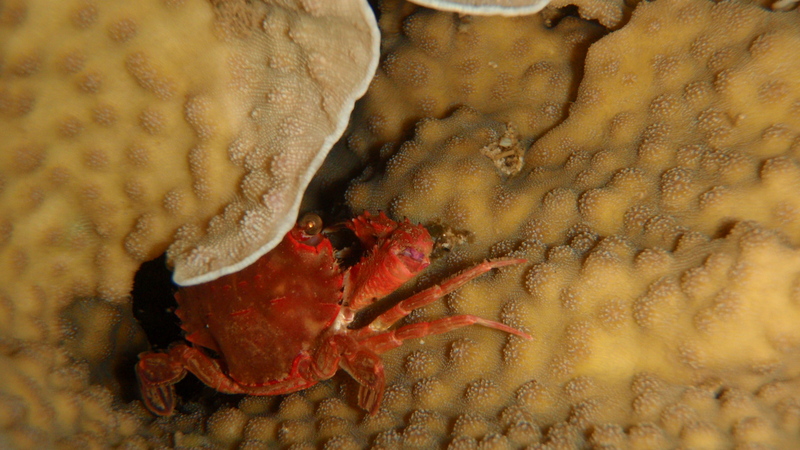 There were sponges, seafans, variety of corals and tropical fishes that abound the area. We ascend after 43 minutes with my air still at 1200 psi. After our leisure lunch and some short nap, Mario summoned us for our next descent. The floating debris continued to increase while the local fishermen roaming around searching what they could salvage from the waters. Our next descent was at Artificial Reefs (AR) area, where there was variety of models of these ARs – tires, concrete, steel. In variety of forms, they were planted around the sandy area, if not for these ARs now home to a variety of marine species, there would be nothing in the spot, probably no life will exist. The area is a home too of the planted clams, now had grown in number and size. Tropical fishes have now claimed the ARs as their home, gaily decorating the area. After having our safety stop on a shallow reef , we ascend after 55 minutes with my residual air at 1100 psi away from the boat. Although we planned for three dives, we called it a day after the second dive. The debris had swarmed the waters and leaving the area late is not advisable. Over us, we found the locals gathered many household effects from the waters which include furniture, clothing, chairs, tv set, range and many more. We arrived back in the city as if everything was in order. But how implausible it was, that we were still diving despite the storm. I learned later that on that Saturday morning under the sun, the flood continues to ravage other districts of Cagayan de Oro, while we are diving in Agutayan waters! How foolish… Perhaps, I have been a fool since I decided to become a diver. Angel and I couldn’t be more grateful how things were arranged perfectly for our dives. I felt so spoiled for such gesture of God’s kindness and faithfulness. Our year-end dive is a subtle statement of God’s abounding grace, generosity and tenderness on our part, without prejudice to the typhoon victims. He surely can calm the winds and the angry seas, He is unstoppable. Tropical Storm Sendong hit Cagayan de Oro on December 16, 2011. Photos by Angel using Lumix TS2 with Ikelite casing. Being hectic for the past weeks and lot of pressures seeping in, it didn’t stop our plans for some quest of exciting leisure that Angel and I have been planning to get into. We have been dying to dive together in MisOr waters plus the advanced water rafting we have been talking about since last year in Coron. I had been chattering about wonderful underwater sites and lately I have discovered that night diving is so exciting, mysterious and challenging. These are too wonderful not to share with Angel who’s been always up to underwater discoveries as we prepare for our Tubbattaha 2010 mission! Rushing my Friday activities, official and personal was some kind of challenge, we got visitors to attend to, then I have to attend a prayer vigil at 7pm– to think it was raining hard that night, I need to rush home to pack my gears! So I wake up the next morning early to pick up our visitor from the hotel and send off at the airport, then by chance pick up Angel too at the airport. I was glad because we’ll be diving at Agutayan Island as arranged by Mario J – a rich marine sanctuary in Jasaan. It’s been almost 2 years since I dove there and I would say it’s one of my fave site – I had my first deep dive there @ 105 ft even if I’m just OWD certified, this was too where I sighted first giant clams and 4 glistening barracudas! Agutayan Island – sand bar, more aptly! After the briefing, we descend for our first dive – it feels good to be in the waters again, swimming & floating in silence. We fish feed (sorry, but it feels wonderful fishes come near me), Angel watching me from behind. We linger for a moment then off going around – school of fishes, sponges, sea fans, lion fish, anemone & clown fish, puffer fish, sweet lips, some grouper, nudi branches, those electric blue juvenile fishes, and more… I forgot to watch my compass :P, keeping in tow with Mario. One of my weights was taken off for balance as well as Angel. We went shallower and after 40 mins passed, Angel surfaced ahead of us with rest of the crew. I lingered for another 10 mins with Mario as I still have enough air. We started our ascent just under our boat, raising my right hand as I swim up like a true diver! J We went 105 ft, such a feat for Angel! We had early lunch during our surface interval to make most of our time and chatting the time away. We had our next descent at the AR area and giant clams. I was hoping to find again the barracudas but we were shallower this time. We had an encounter with the trigger fish who wanted to attack us as we passed her breeding area. The clams I noticed get lesser – I heard some of it was stolen from the sanctuary during the typhoon last year. But I saw smaller clams, hoping it would multiply soon – too wonderful to watch the specie. 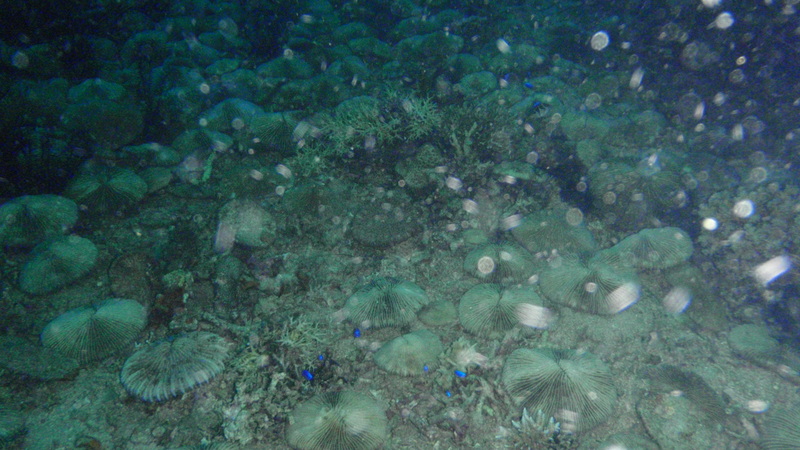 The ARs were bit disheveled perhaps due to the typhoon and last time it was too colorful with the soft corals on it. The surrounding is still rich with marine life though. We surfaced together after 55 minutes, Angel’s air consumption improved after his weights were reduced to three. We had a much longer surface interval this time as we will wait to get dark for our night dive – this will be my first time for 3 dives in tow after my advanced lessons. I was excited for the night dive with Angel. I tried to convince him that he will be allowed to do it even if he has not taken the exercise yet. J We asked PJ if we could go to the white island to explore it, Mario said we will do beach clean-up. Such a pretty idea, an environmentalist attempt to do something useful while enjoying the splendor of the site. We were in the same site with ARs, as expected the vista was like a different world – dark with only our lights illuminating for us. This time I tried to look around for my companions – Mario, PJ and of course Angel, check my gauges – my air is not a concern actually. We search for moray eels, unusual fishes under the ARs, passed by a big gorgonians, pipefish?, puffer fish, porcupine fish (a favorite), a crab with unusual shape, anemone and clown fish, sea cucumber. We curiously search under the ARs, then we sighted a swimming nudibranch – wonderful sight! J I tried to reach for Angel’s hand when I felt some current somewhere. But truly it was such a magnificent encounter – exploring underwater at dark is something mysterious, wonderful, majestic! Finally, Mario signaled for ascent – I stayed close to them as we swim up. We surfaced away from the boat and the waters still choppy! The boat came over as we swim back to it – it was not easy for me because my BC keeps on deflating and worst my right fin got loose so I took it off fearing it might get lost! So I was swimming with my left fin only – it was tough! We went 65 minutes at 50 ft deepest – wow! J As soon as I got unto the boat I rushed to the rest room – I threw up! Angel drop by as we head for Divisoria, we need to be there at 8am but he wanted to walk going to the meeting place, we arrived late already and the group have been waiting for us – it was good they waited for us (I got 5 missed calls but didn’t notice it!). We got into the jeepney bringing us to Uguiaban near the bridge. We were joined with others (a couple & 2 guys) in one raft, and have Baldo & Ricky as our river guide. I was just excited and could feel the rush – finally, after more than a year of waiting! The run is 18 kms with 21 rapids, and will take 4 hours from Uguiaban to Kabula. Angel and I chose to sit in front, we agree it’s more fun to feel first the rushing water on us! J The water was brown but still I love the sights along the river, green mountains, blue skies, lush vegetations. Nothing beats nature’s beauty and going thru the rapids is so adrenaline rushing. Our aim was never to be thrown into the water, paddling thru the rapids is challenging… We had a stop over midway, for a break and had photos. We took time also at the calm part to jump out and swim in the murky waters. Well, we enjoyed so much the rapids and no one fell into the waters! J We arrived kabula almost 1pm, and went straight to the resto for our lunch. We are all famished, it felt like forever when we wait for our food. We took our lunch leisurely trying to savor our food, I’m thinking about dining with pleasure…. We got on to our transpo for down town, dropping by at Rafting Adventure office for our photos. I felt dirty and all I wanted is to wash off and take rest. Angel and I went home by trike and settled to attend the 5:30pm mass. I doze off after a rush bath, waking up late at 5:15. Rushing things, Angel came who wake up late too despite the alarm! It was raining, and we rushed to XU – the mass just started when we arrived. We drop by home before dinner, I just need to change and picked up my notebook. Angel wanted to dine somewhere like Margie’s – something like to cap our weekend adventures! 🙂 We went off to LKK mall walking – another exploration of CdO bie nacht on the other side… We settled at Bigby’s (Angel like its ambiance) and tried to investigate its menu trying to find something to our liking – and we end up with Passion Fish and veggies in butter. The servings we found later was too much I cant finish the whole thing! Well, dining taking our time while browsing the net – taking pleasure what we have before us – life is beautiful! 😀 We discussed too our next months’ trips for itineraries, arrangements, schedules – we got skeds until September! We finished off as Angel needs to rest sooner for his morrow’s early flight, we walk again back home.